I went to bed last night thinking to myself that "hey if it's nice tommorrow, I might spend the day at Shea stadium." The sun shown brightly this morning and I checked the weather channel for the forcast. With thes sun shining in the afternoon and looming rains storms in the evening I decided to chance it and head out. It was a great day at Shea Stadium overall. I was frisked on the way into Shea Stadium. Must be to protect against terrorism. Then my ticket was scanned and I was in. But before I was too far in someone stopped me and said "here is your hat." 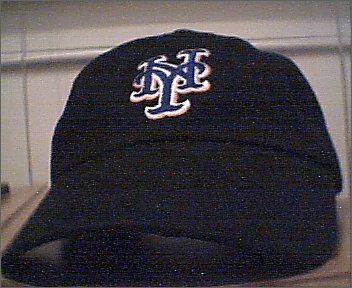 Apparently I was at "Cap Day" for the first 25,000 fans to Shea Stadium. An added value considering I wasn't expecting or knew about cap day. The Mets lost the game 7-6 in a close game. I am now 0-2 lifetime for the Home team at Shea Stadium. Perhaps it is me and Pedro Martinez together that curses Shea. Both times I attended a game at Shea, Pedro Martinez has started the game and has not done very well. Who knows. Maybe next time I will go to the Bronx to visit New York's other team. I am 1-0 when they are playing at "The Stadium."